When you have one theory for one court, and a different theory for a later one, it probably isn’t going to turn out too well. 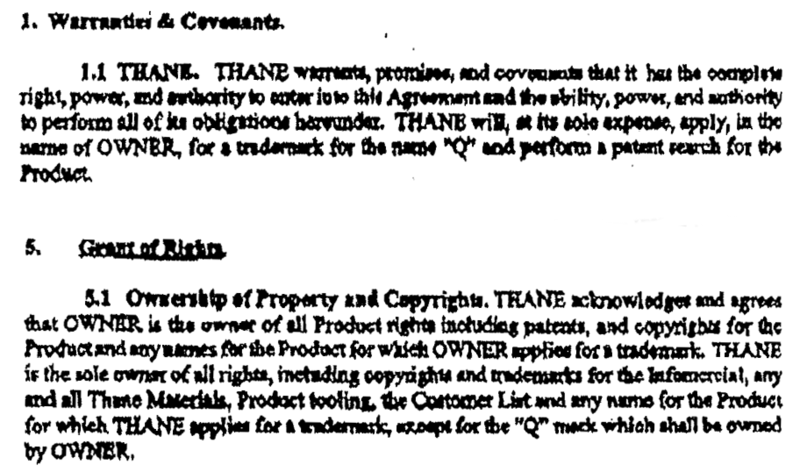 1.1 … THANE will, at its sole expense, apply, in the name of OWNER, for a trademark for the name “Q” … . 5.1 Ownership of Property and Copyrights. THANE acknowledges and agrees that OWNER is the owner of all Product rights including patents, and copyrights for the Product and any names for the Product for which OWNER applies for a trademark. THANE is the sole owner of all rights, including copyrights and trademarks for the Infomercial, any and all Thane Materials, Product tooling, the Customer List and any name for the Product for which THANE applies for a trademark, except for the “Q” mark which shall be owned by OWNER. But of course Thane registered the trademark in its own name. Several years later RKS sued Thane for trademark infringement of the Q mark in two different courts (I don’t know why they did it twice, although there are motions relating to change of venue and personal jurisdiction in the record). The parties ultimately settled, with Thane executing a nunc pro tunc assignment of the Q mark to RKS effective on March 5, 2002, the effective date of the manufacturing Agreement and nine days before the original trademark application was filed. RKS also filed a malpractice suit against its law firm. Throughout all of these affairs, RKS steadfastly maintained that Thane’s application for the Q mark should have been filed in RKS’s name. Preceding the litigation, Thane had entered into a settlement agreement with Weber, allowing Weber to have a co-existing “Q” mark. In the infringement lawsuits between RKS and Thane, RKS considered Weber an infringer and, while we don’t have the details about how it reached this point, Weber ultimately filed the petition to cancel the registration now owned by RKS. Sharp readers will have spotted the problem—as stated by the TTAB in the cancellation, “If the applicant does not own the mark on the application filing date, the application is void.” RKS therefore changed its tune, filing a new nunc pro tunc assignment voiding the earlier one and changing the effective date to one after the registration date of the original application. Second, not every entity which has an intent to use a mark is an owner of the mark. A non-exclusive licensee may have an intent-to-use a mark in commerce, but it is not an owner of a mark. The same holds true for an exclusive licensee. 45. Explain why there is a difference between the allegations of ownership of the Q Logo in RKS’ California and Oklahoma litigation filings, and the answers in this cancellation proceeding. ANSWER: … RKS states that the different allegations of ownership stems from advice of counsel and in order to comport with reality. This brief response does not offer a satisfactory explanation for RKS’ change in position, but rather suggests an attempt to dodge the strong evidence that RKS considered itself as the owner of the Q Mark at the time Thane file its application. It appears to us that after RKS settled with Thane, and the dispute with Weber commenced, that RKS changed its position and re-interpreted the PEM Agreement to provide that Thane was to obtain a trademark registration for the Q Mark and then transfer the registration to RKS. Thus, in view of the suspicion we have about RKS’s “story” which is in now advantageous [sic] to RKS in this proceeding, but which is not consistent with RKS’ positions in the past, the glib response to Interrogatory 45, and the reasons provided above, we find that the owner of the mark at the time the application for the Q-Mark was filed was not Thane, and that the application which matured into the ‘586 registration was void ab initio. This was just disaster upon disaster in decision-making. I hope all decent trademark lawyers out there would have realized from the moment they saw the first application that it was irretrievably void. The rub, though, was in the dates: (1) March 14, 2002, Thane ITU application filed; (2) December 17, 2002, first use date by Weber; (3) March 1, 2003, first use date by Thane. If Thane’s ITU application failed, then Weber was the senior user. Nevertheless, why RKS elected to go after Weber, rather than quietly coexist, is beyond me. Thanks to John Welch for the case. Weber-Stephen Products LLC v. RKS Design Int’l, Inc., Cancellation No. 92054172 (TTAB May 10, 2016). * You know you’re in trouble when the tribunal counts the ways you are so wrong. Whenever I see a bunch of companies in one industry interested in the same seemingly random mark, I automatically wonder how random that mark is to that industry or if perhaps there is some meaning or significance to that mark in that industry. I grill with a Weber grill but I am not aware of any significance in meaning in the letter “Q” to the barbecuing field. Is anyone else?